We can’t all be Mama Kwan Approved, or at least we couldn’t, until now. 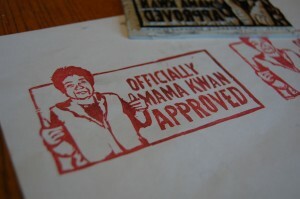 When Katrina and I left the Dumpling Iron Chef (backstory below), our bellies nearly bursting like and with many of the dumpling interpretations we’d eaten that night, the thing that remained on my mind was Mama Kwan’s approval – and so I decided to immortalize her in a rubber stamp. 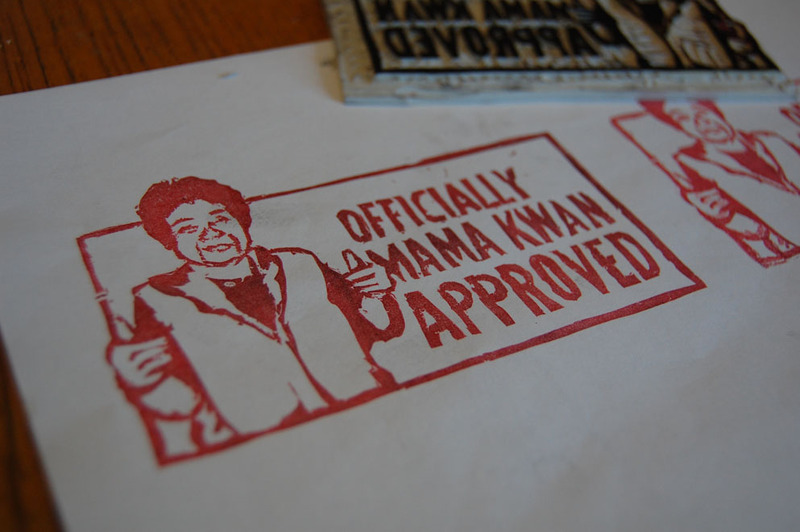 But I’d never made a rubber stamp before. Following is the process, and the final product. The photo May took went directly into Photoshop, which has a filter conveniently called Stamp (under Filters>Sketch), that will get your image ready for cutting. Balance your whites and blacks and you’re ready. 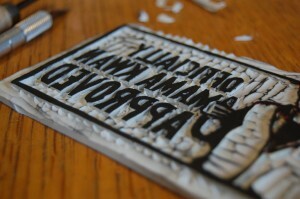 After adding the text, the surrounding border, and a couple of tweaks, I printed it out on a regular printer. Nothing fancy. 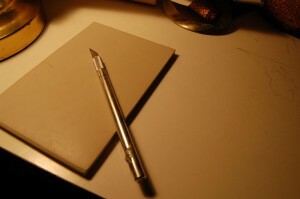 A clean slate. 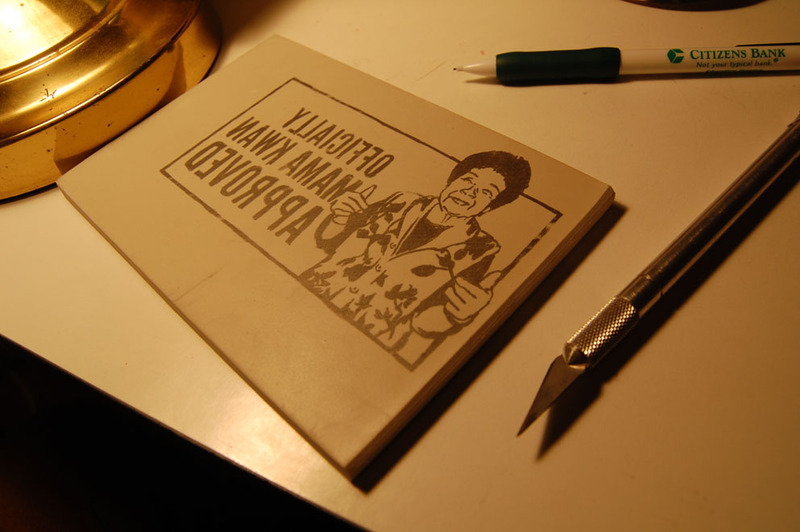 I picked up this rubber pad at a local art supply for less than 2 bucks. Before we can carve, we’ve got to get the image from the printout onto the rubber block, and we need it to be flipped horizontally so it stamps in the right direction. The idea here is to cover all the black areas with pencil. If the ink from the inkjet hadn’t dried so fast, perhaps I could have skipped this step, and transfered the printer ink directly to the rubber pad. The paper is placed on the rubber block with the graphite side down. Then I rubbed the back, clean side of the paper, which transfered the graphite onto the block. Here I used one of Katrina’s knitting needles, which was dull and didn’t rip the paper, and went up and down while moving slowly across the page. 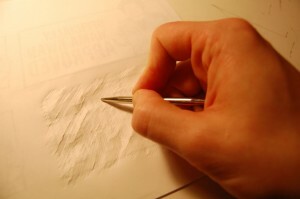 I noticed the paper starts to stretch/distort so be careful… tacking it down with tape might help. I was pretty surprised that it had worked so well. The image is backwards on the block, and when it stamps it will be the correct direction. Cutting... tedious or meditative. You decide. 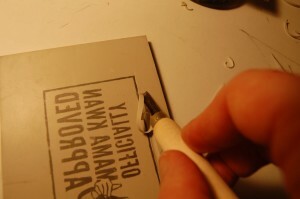 I began cutting out the negative space (the white), using an exacto for the sharp edges and a gouge (the rounded blade shown left) to dig out larger chunks. It’s a really rewarding feeling to gouge out long strips of rubber… like butter. It took a little while, and it was impossible to get the level of detail I wanted with the soft rubber that bent to easily to make precise cuts with dull tools… but it was a satisfying process. 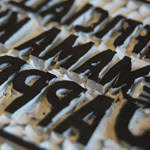 There’s a lot going on visually within the stamp itself with the (cool) texture that remains from the many cuts, but only the raised parts show when you stamp it as you can see. I was sad to lose a lot of the detail in her face, but was also happy enough with what I had. Other pieces I gave up on entirely, like the detail in her sweater. 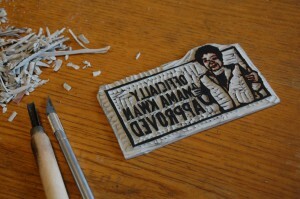 I might try and get a harder rubber block next time. All in all pretty happy. Let me know if you try it or have any tips. May and her friends had been throwing a string of Iron Chefs. 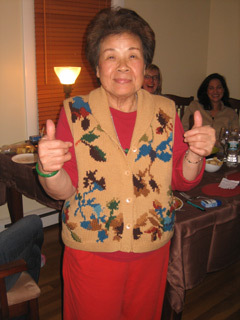 As the hostess and previous winner, May called the shots and she had chosen not an ingredient, but a theme – dumplings. Delicious. 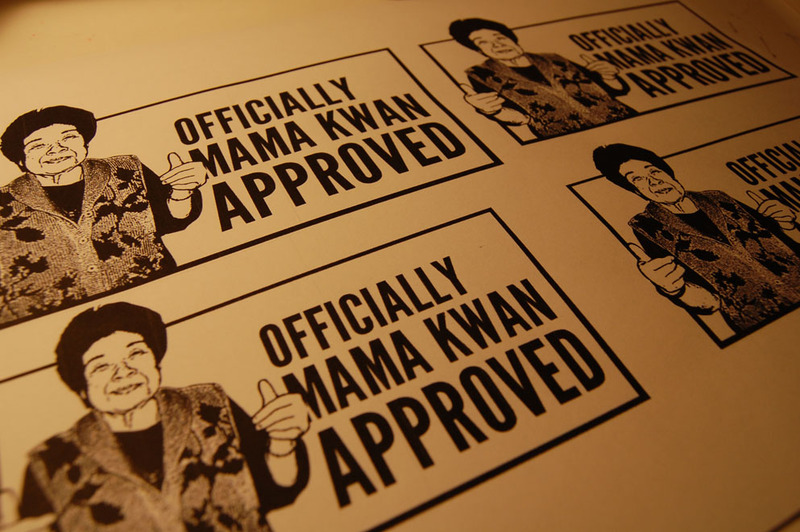 The evening was fun, and we were stuffed with all sorts of dumpling interpretations, but what I’d latched onto was the approval of Mama Kwan. Though she didn’t have a vote in the competition, she somehow set the gold standard. 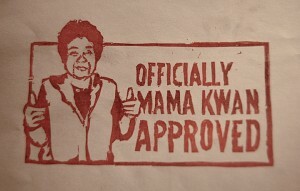 What would it take to get the approval of Mama Kwan? 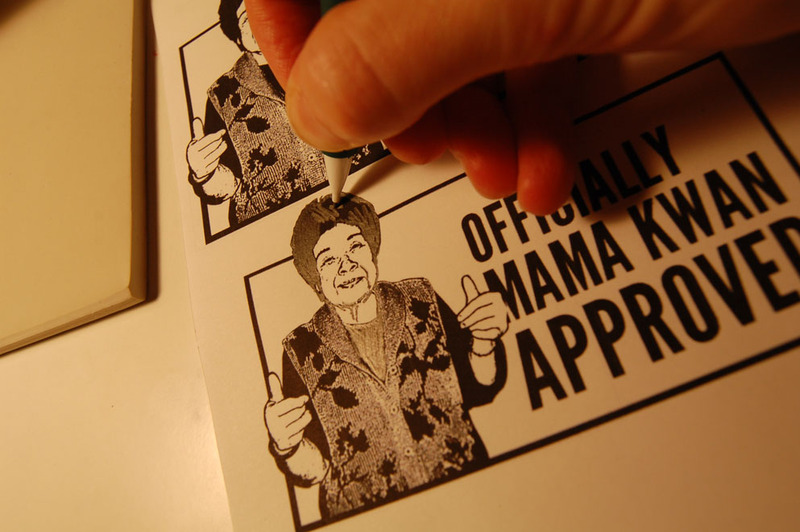 Before we left, we got May to grab some photos of her Mom giving the thumbs up – she appeared to enjoy the impromptu photo shoot – and I proclaimed I’d transform them into a stamp. 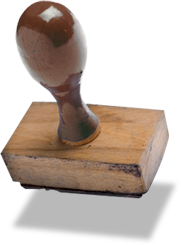 I didn’t totally know what that would entail but I’d been toying with the idea of making a stamp and figured this was as good a reason as any to get started. 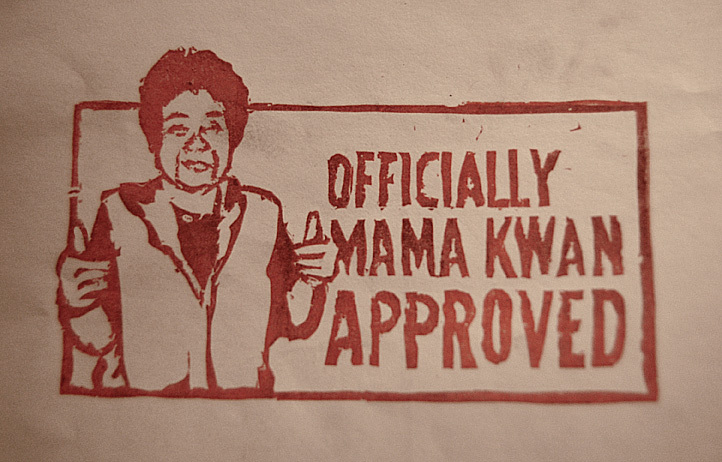 But honestly, it’s too much power for me to wield – I’ll give the stamp to May and her mom for the holidays. For the record, we came in 2nd place with our “Soup Dumpling” — a wrapped spoonful of rich cream soup and shitake mushroom, flavored with lemongrass. Our other, glutonous dumpling grabbed a mention and some surprised laughter – inside its panfried wrapper was a Grand Marnier soaked chunk of a bonafide Boston Cream donut. Hi Jonah! Just want to say that I reread this entry today… and it still brings such a smile to my face! 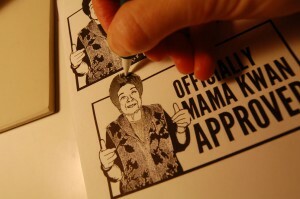 Thank you again for immortalizing my mom in a stamp! Love it! 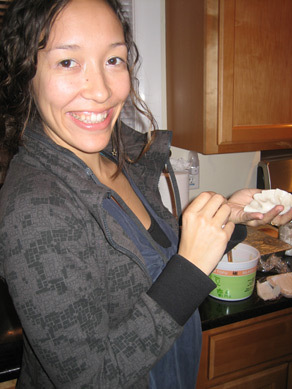 Miss you and Katrina…hope you guys are doing well!